Financial Ratio templates for Excel (Financial Ratios Dashboard) provide a professionally designed report of key financial ratios and trends from standard financial statement data templates. The financial ratios update automatically from data entered or linked into standard financial statement templates including income statement, balance sheet and cash flow statement. Key financial ratios update to new or modified accounting statement data. Financial and business metrics are measured and displayed over a five year period. Financial ratios are presented in a summary report with charts and trend analysis. The dashboard report is configured to print on one page for high quality publishing. 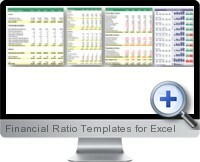 Two sets of financial ratio templates serve for both Excel 2003 and below and Excel 2007 and above.